There are now many resorts on offer that need very little in terms of sporting ability or skill. All you need for walking and hiking in snow is waterproof walking boots; hat, gloves, decent insulated walking trousers, and layers that you can take off if you get too hot – and put back on when it gets even colder in the ice and snow! Snow Walking – What is it? Most organised snow and ice walking takes you down along specially prepared paths that have been pre-flattened by a machine, so you won’t have to worry about finding yourself up to your armpits in an unexpected snowdrift – and if you take an organised route you won’t even have to worry about losing your way. Snow-shoeing does need different equipment, but it’s not hard to get the hang of once you’ve got the shoes on. All you have to get to grips with is how to walk with your feet slightly wider apart than usual, and you’re off on your way. You’ll need to get hold of a pair of snow-shoes, which you just attach to walking boots and two poles, and then you’re off. Usually down pre-prepared routes again, so you’ll miss the cross country skiers, snowdrifts and any treacherous ice. If you are going out without a guide, or hiking a route that’s not specially made for walking and hiking, you need to take more precautions. Even though you’re only walking, snow and ice can be dangerous. 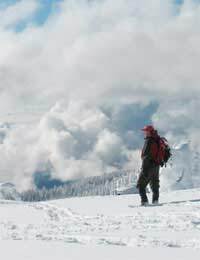 Always check the weather forecast before going walking or hiking on a route you don’t know, and be prepared for changes in the weather each time you go out. Take your sunglasses, sunscreen – and also take your storm gear and extra warm clothes. Make sure you stock up on food and drink you need extra fluid when you’re taking part in any strenuous winter activity. It may only be walking, but ice and snow are harder to negotiate, and the cold can really take it out of you. It can happen – you might get lost or the weather might turn nasty and you find yourself stuck in the cold. It’s essential if you get lost to stay where you are and keep yourself warm. stay put and stay dry. Carry a flask of warm liquid and some high calorie snacks with you just in case, and a fire lighter in case of an emergency. If you need to light a fire, take the lower branches from the trees as they are more likely to be dry than higher ones. You can create a makeshift shelter in ice or snow if you dig a trench, and while you’re at it, make a huge mark in the snow, in the shape of an arrow or an ‘X’ so that if you need to be rescued, you’re easier to spot!